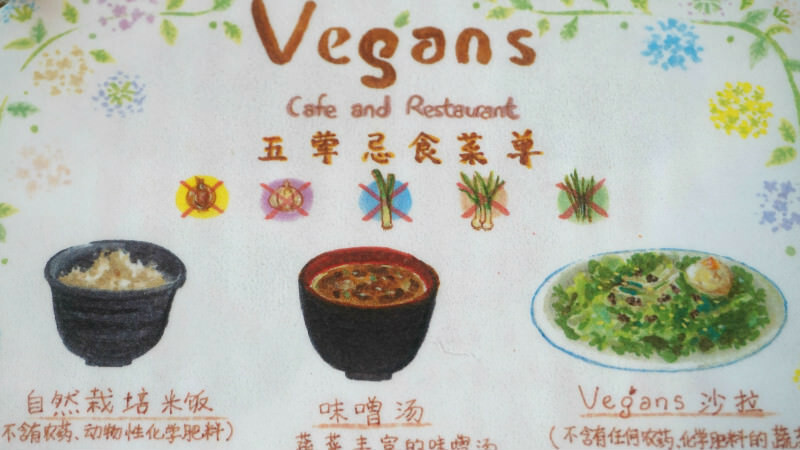 When it comes to restaurants that offer only vegan food, you’re not left too many choices in Kyoto. That’s why it’s so nice that Vegans Café and Restaurant gives you the option of having great vegan food close to Fushimi Inari Shrine. The restaurant is most famous for its deep-fried tofu rice bowl and ramen. And unlike some other vegan restaurants, Vegans Café’s portions are so big that you are sure to leave the restaurant behind with a full belly. All the dishes here are handmade, so you may have to wait a bit before you get to eat, but the taste is easily worth it. First things first, at Vegans Café you get to choose the dough of the pizza, crispy or bread-dough, but this deep-fried tofu pizza only has the latter option. That tells you something about how much stuff there is on the pizza. The photos don’t do this pizza justice; in real life, it’s much bigger. And delicious! The vegan soy-cheese tastes so good that it’s almost better than cow-cheese. This portion of ramen is not cheap, but you do get really a lot of noodles. In fact you get almost enough for two people, especially those who don’t normally eat that much. The taste is also very rich, and I felt like there was something sesame-like in the taste. The noodles also go down really well, and have a nice sort of texture to them. This parfait contains no milk; it’s completely made from soy-milk and other plant-based ingredients. Kyoto is famous for its desserts, especially the parfaits, so it’s great that there now is a vegan option that can compete head-to-head with some of the best parfaits in Kyoto. Also, it’s huge; there is enough soft serve for three people. The restaurant owner and staff try all the wines they offer at the restaurant themselves first, and ascertain that there are no ill effects from drinking them. This is why all of them are organic. They also offer take out for 100 yen extra. I was really surprised by the tastiness of the food here. I had read some reviews saying the food here was excellent, but the strong tastes still surprised me. I especially liked the soy milk miso ramen, which had a creamy soup that packed a surprising punch. A 7-minute walk from Keihan Fujinomori Station. Monday, Tuesday, Thursday, Friday, and Sunday: 11 a.m.-5:00 p.m. Saturday: 11:30 a.m.-9:00 p.m. The restaurant also sells organic vegetables. They have not only a menu in English, but also a Chinese menu without the five pungent roots. Available for groups of more than 10 people but you need a reservation. Nonsmoking. They have a smoking area outside of the restaurant.